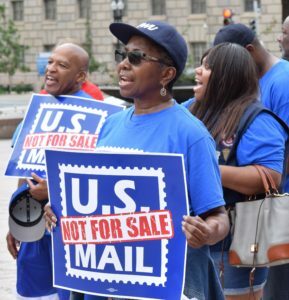 The US Mail Not for Sale is a worker-led campaign sponsored by the American Postal Workers Union and the National Association of Letter Carriers. The campaign brings together labor unions, elected officials, member organizations of A Grand Alliance to Save Our Public Postal Service, community supporters and the public to fight plans to sell the public Postal Service to the highest bidder. Our goal is to preserve affordable, universal mail service for all – without regard to where they live, age, nationality, income, or race. The White House, for the first time in history, proposed to sell the Postal Service in Delivering Government Solutions in the 21st Century by the Office of Management and Budget. If implemented, the White House plan would end regular mail and package services at one affordable price for everyone regardless of where they live. Eliminating the universal service obligation – requiring the Postal Service to deliver daily to all 159 million addresses – would be a dagger aimed at the heart America, especially rural communities and the elderly who depend on the mail for prescriptions. It also would disrupt e-commerce. The United States Postal Service (USPS) is the only federal agency enshrined in the U.S. Constitution. Our goal is to preserve affordable, universal mail service for all – without regard to where they live, age, nationality, income, or race. It belongs to the people of this country. Let’s do whatever it takes to keep it for generations to come! Call your members of Congress today and tell them to support a PUBLIC Postal Service!